I attended Brougham Street School in Skipton from the age of 4 to 14. I recall that my teachers were surprised at my drawings. I spent my childhood from a very young age either climbing trees, gas lamps and factory walls or drawing. I loved drawing; it was my principal hobby from toddlerhood onwards – faces, figures, birds, trees. I also made planes and galleons out of bits of wood I found. Albert Cooke taught me the skills of woodwork and how to make fabulous ships from pieces of wood. I started work aged 14 as an apprentice at GH Mason, Skipton – an upmarket painting and decorating company. As part of this apprenticeship, I attended Keighley Art School on a Saturday morning and one evening. This changed to nightly attendance as my interest in taking art further deepened. A painting hung in my grandmother’s house - an oil painting by my Great Grandfather Tillotson. As a small boy, I used to stand on a chair to study it. It was a bird’s nest with eggs inside and two birds perched at the side. I was particularly inspired by the lettering used by our weekly newspaper The Craven Herald – which fascinated me and I spent much time copying it. The style of the lettering was Gothic and Teutonic. 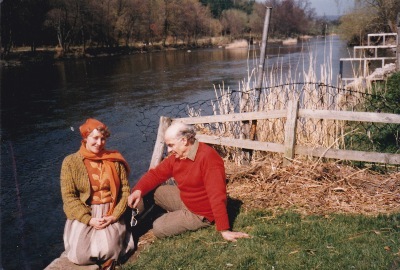 During my apprenticeship at 14 to GH Masons, in Skipton, I was apprentice to a senior painter – Bob Leach - who I admired greatly – a wonderful man – a master craftsman. Through him, I learnt the art of glazing, lettering, graining, shading and stenciling. Paint was made using powder and spirit – the latter was often sampled leading to merry work. Masons expected their apprentices to attend art school to develop their skills. This opened the door to me attending Keighley Art School. Finally, the visiting Skipton fairground throughout my childhood entranced me – the roundabouts of painted wooden horses - their colour and form. I used to watch a man sitting on a wall sketching the scene in front of him. Watching him, stirred in me an urge to develop my talents in drawing. Many years later, this directly inspired me to make the sculpture “Roundabout” 1955 now in the Peggy Guggenheim Collection, Venice. I studied at Keighley Art School from 1940-42 while working full time at GH Masons as an apprentice painter and decorator during the day. After work, I caught the train to attend the art college every night. In 1942, I won a County Art Major Scholarship to study art at Leeds Art School. However in 1943, at 17 years old I was conscripted through National Service to work in the Yorkshire coalmines until 1946 as a Bevin Boy and so my training at Leeds Art School was postponed for duty to country. I was assigned to a pit just outside Leeds and was given lodgings with a miner’s family who were wonderfully kind and caring toward me. Miners are marvelous people. When released from service, my hands were calloused but my spirit was undaunted and I took up my scholarship at Leeds. After my experiences down the pit my admiration for miners has remained with me all my life. From 1946-48 I studied at Leeds School of Art where I had some wonderful teachers – Mr Talbot, Mr Dickinson, Major Abbot and Mr Daniels. I learnt a great deal at Leeds through these inspiring men. Learning about perspective from Major Abbot shook me rigid as it was such a difficult craft to master. Mr Talbot was very innovative in life drawing. 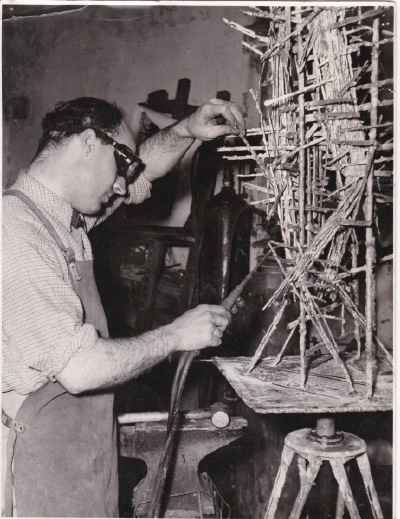 Through a Scholarship, I won a place at the Royal College of Art (RCA) 1948-51 after submission of my portfolio and felt very honoured as there were only 10 places per year in the sculpture school. At that time the RCA was headed by Professor Robin Darwin – Great Nephew of Sir Charles Darwin. Professor Frank Dobson was in charge of the sculpture school and I admired him greatly. My knowledge of sculpture was exhilarated by visits to the British Museum and actually handling very early Cycladic terracotta figures, simple and direct. It was an inspiring experience I could never forget. I continued my studies in the British Museum while at the Royal College of Art (1948-51), where I became interested in European contemporary work in sculpture and painting, in addition to the emerging English metal sculpture. Graduating from the Royal College in 1951, I started experimenting in linear drawing moving freely between figurative and non-figurative. Figures enclosed within structures or emerging from assemblances, reflect the human predicament both playful and threatening. I did not set up abstract sculpture in opposition to figurative. A piece of sculpture should be both. Figurative to the extent that it is a represenation of space. The spaces between and around objects and settings are almost as rich as the objects themselves. I was determined to depart from tradition and strike out in a new field using metal instead of the conventional materials of the time; I wanted to model in metal rather than in clay. In 1953, I took myself off for a 2-week instruction in the art of welding at the British welding school in Cricklewood. After this, I found a derelict, disused stable to in Tooting, London for my studio. I used British Oxygen equipment and a lightweight Saffire Blowpipe to create my figures and forms. I was first enthused by the idea of welding when I recognised the possibility of making three-dimensional equivalents of the drawings of Rembrandt, which I hugely admired. I had the idea of welding “a little comb” of tiny, fine rods to emulate Rembrandt’s cross-hatching, a theory I successfully put into practice in Carousel (Roundabout), 1955 bought by Mrs Peggy Guggenheim and now in the Peggy Guggenheim Collection, Venice. At the time, most artists in the early 1950s were producing busts and forms from clay and carvings from wood. There were only a few of us breaking free from the traditional. 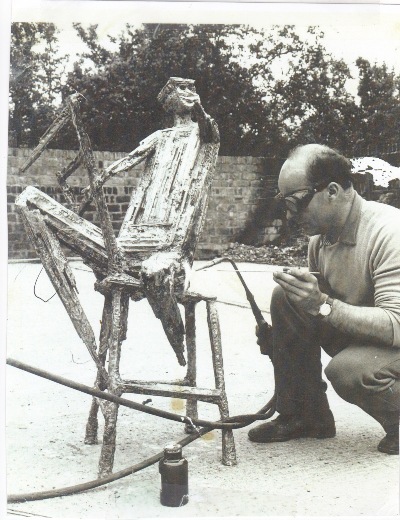 I was very nervous at the reaction I might receive when I presented my first welded metal sculptures, Facade 1954 and Men Fishing from a Pier 1955, to the Gimpel Fils Gallery in London. But, they liked them; and better still, they wanted more. Belief in this new style of sculpture was soon justified when two pieces: “Figures in a Wood” and “Façade” were immediately sold to a collector in the USA. It was amusing to see myself described as a “revolutionary” in a newspaper in the early 50s but good to see my work described as “exciting, invigorating work.” In one year, collectors in the USA and Canada bought 15/20 of my sculptures. In fact, most of my sculpture was bought by US collectors but a small number remain in the UK in public and private collections. 1950s Britain was a bleak place, a time of post-war austerity and fear – people here seemed not quite ready then to depart from the conventional art of the time. Line rather than mass seemed the expression of a more urgent fleetingly emotive quality in the uneasy atmosphere of the immediate post war years. This is what Sir Herbert read once called the Geometry of Fear. It reflected the mood of the 1950s in the aftermath of World War 11 - the inhumane cruelties perpetrated - with the rising despair of more horrors to come with the Cold War. My sculpture, Gladiators, 1958, Leeds City Art Gallery exemplifies the subject of conflict with two figures engaged in permanent deadly combat. Two of my sculptures Figure in a Setting, 1954 and Dying Warrior, 1956 were included in the “Geometry of Fear” Arts Council touring exhibition in 2007. Art is a perverse chameleon, yet art is the fruit by which we recognise civilisation’s tree. I see my work as drawings in space. All had to change in the mid 1960s, as having had two children required a predictable salary and I had to take on full time teaching and leave London. With great regret, I had to reduce the time I could devote to my creative work, as with a young family, life’s priorities had to change. Later in my career, alongside full-time lecturing, with less time available to me, I became attracted to volume and mass using geometry and colour in structures made in aluminum - and I produced various designs of Argosy, 1969. Later in the 1970s I experimented with solid bronze forms for example; Seascape, Window on Childhood, Birth of Venus and Sun on Landscape. In retirement, I returned to my native Yorkshire and I rekindled my love of drawing and produced a number of paintings of Yorkshire landscapes and people in settings using watercolour and oils. After my dear wife Connie died at the end of 2013, I decided to stop painting. "I took a flower from life's garden; Constance who showed love and understanding to anyone who knew her. My life was enriched and enhanced by knowing Constance - beyond measure"
9 February 2016 Leslie sadly died after a short illness having lived with his daughter for his final months.